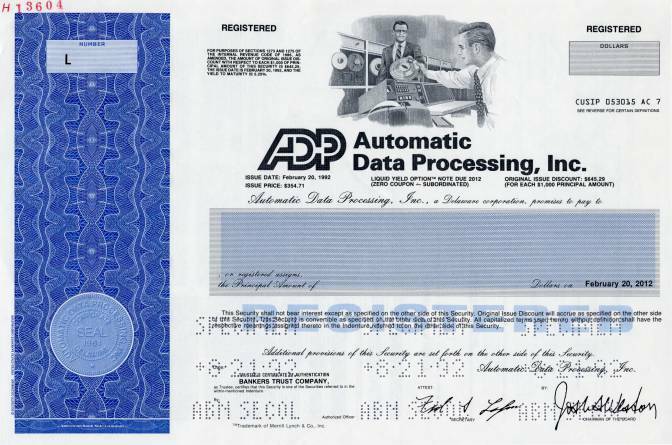 Beautiful RARE specimen certificate from the Automatic Data Processing, Inc. Company printed in 1992. This historic document was printed by the American Bank Note Company and has an ornate border around it with a vignette of two men in front of an old computer holding tape from a drive. This item has the printed signatures of the Company's President, and Secretary. The ADP National Employment Report (also popularly known as the ADP Jobs Report or ADP Employment Report) is sponsored by ADP, and was originally developed and maintained by Macroeconomic Advisers, LLC. The report's methodology was revised in November 2012 by Moody's Analytics. The report is a measure of non-farm private sector employment which is obtained by utilizing an anonymous subset of roughly 400,000 U.S. businesses which are clients of ADP. During the twelve-month period, this subset averaged over U.S. business clients and over U.S. employees working in all private industrial sectors. In 1949 Henry Taub founded Automatic Payrolls, Inc. as a manual payroll processing business with his brother Joe Taub. Frank Lautenberg joined the brothers in the company's infancy. In 1952, Lautenberg became Chairman and CEO of the company. 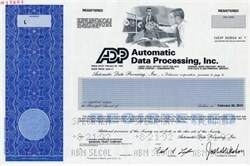 In 1957, the company changed its name to Automatic Data Processing, Inc. (ADP), and began using punched card machines, check printing machines, and mainframe computers. ADP went public in 1961 with 300 clients, 125 employees and revenues of approximately US$400,000. The company established a subsidiary in the United Kingdom in 1965 and acquired the pioneering online computer services company Time Sharing Limited (TSL) in 1974. Lautenberg continued in his roles as Chairman and CEO until elected to the United States Senate from New Jersey in 1982. Bob Kerstein, CFO of Falcon Cable TV, first used ADP in 1980. From 1985 onward, ADP�s annual revenues exceeded the $1 billion mark, with paychecks processed for about 20% of the U.S. workforce. In the 1990s, ADP began acting as a professional employer organization (PEO). Around this time, the company acquired Autonom, a German company and the payroll and human resource services company, GSI, headquartered in Paris. Kerridge Computer Co. Ltd., a dealer management systems (DMS) provider to auto dealers in the UK was acquired in 2006. Automatic Data Processing, Inc. (NASDAQ: ADP) Automatic Data Processing, Inc. with about $10 billion in revenues and approximately 545,000 clients, is a provider of business outsourcing solutions. ADP offers a range of human resource, payroll, tax and benefits administration solutions. It is a provider of integrated computing solutions to auto, truck, motorcycle, marine, recreational vehicle, and heavy equipment dealers throughout the world. ADP is one of four U.S. companies to get a AAA credit rating from Standard & Poor's (S&P) and Moody's.